Why does a lobster change colour on cooking? This posting, Helen Maynard-Casely tells me, has a Christmas aspect. At Christmas time colleagues ‘down under’ are tucking into cooked lobster whilst the rest of us ‘up north’ are having Christmas turkey! 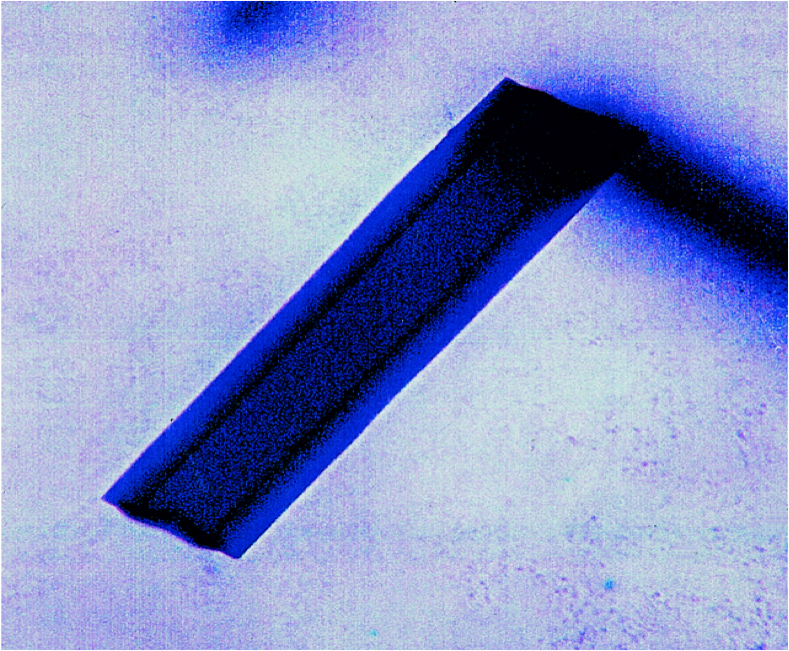 Crystal grown by the microbatch method in a 2µl drop under oil. The photograph shows the natural blue colour of the crystal. Crystal size: 100 × 100 × 500 µm. Courtesy of Prof Naomi Chayen. The active coloration molecule in the lobster shell is astaxanthin (AXT). 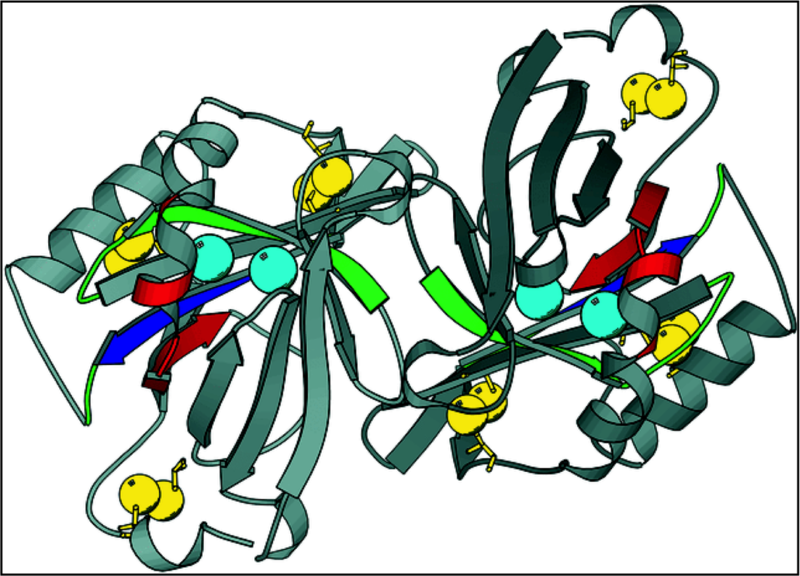 When it is bound to the lobster protein complex crustacyanin it is blue-black and when not bound to the protein crustacyanin AXT is orange-red (at equivalent dilutions). The molecular geometric and electronic factors which cause this colour change (a bathochromic shift) have been identified from the X-ray crystal structure of beta-crustacyanin (Cianci et al 2002). The protein releases its grip on the AXT when the protein would be denatured – such as by boiling. The AXT causes the crustacyanin to adopt a quite different arrangement of protein subunits compared with the apocrustacyanin (Cianci et al 2001). 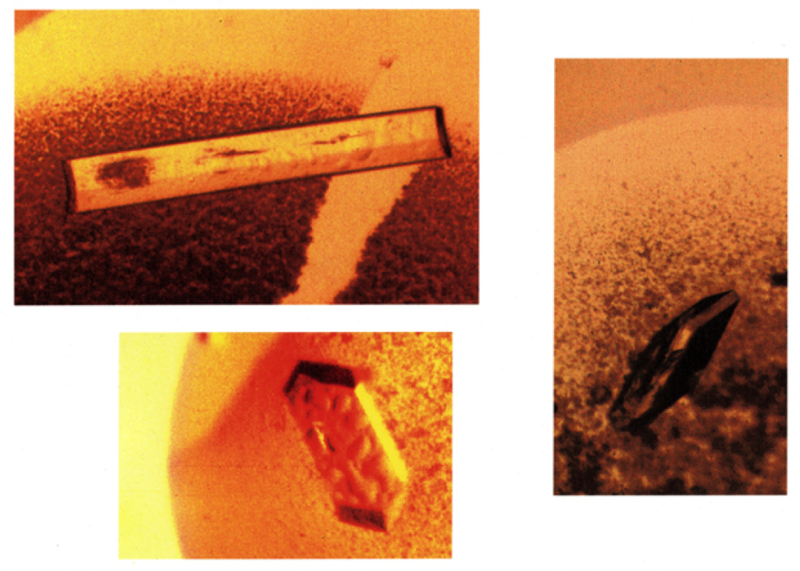 The whole project of studying beta-crustacyanin and of apocrustacyanin by X-ray crystallography was made possible through the expert research on macromolecular crystallisation, and also the growth of these particular crystals, by Prof Naomi Chayen and her coworkers at Imperial College in London. Apocrustacyanin A1 crystals; different crystal habits, identical unit cell dimensions (Naomi Chayen, Imperial College, London). Intriguingly other lobster crustacyanins such as the Australian Western Rock Lobster has ‘red’ and ‘white’ phases of its life cycle but not blue-black along with an interesting genetic make up in this respect (Wade et al (2009)). Cianci, P.J. Rizkallah, A. Olczak, J. Raftery, N.E. Chayen, P.F. Zagalsky and J.R. Helliwell “Structure of apocrustacyanin A1 using softer X-rays” (2001) Acta Crystallographica Section D-Biological Crystallography D57, 1219-1229. Cianci, P.J. Rizkallah, A. Olczak, J. Raftery, N.E. Chayen, P.F. Zagalsky and J.R. Helliwell “The molecular basis of the coloration mechanism in lobster shell: β-crustacyanin at 3.2 A resolution” (2002) PNAS USA 99, 9795-9800. Wade, N.M.; Tollenaere, A.; Hall, M.R. ; Degnan, B.M. Evolution of a Novel Carotenoid–Binding Protein Responsible for Crustacean Shell Color. Mol. Biol. Evol. 2009, 26(8), 1851–1864.